Don’t you just love that “new house” smell? You know, where everything is new, clean, and fresh? Unfortunately, over time, that smell tends to fade, replaced by the stale odors of day-to-day living. Whether your house suffers from must, pet odors, poor air circulation, or is just plain old, there are ways you can retrieve that fresh scent again. The kitchen is the heart of the home, so it is important to check here for your odor culprits. With all the traffic and food preparation that occurs in this space, it is no wonder your house may be developing an odor problem. Though your cooking habits may be the root of the smell, you don’t have to change your cooking regimen. The solution lies in doing the small things. Make a point of emptying the trash frequently and always disposing of it after throwing out food. Use your stove’s vent to air out the kitchen and prevent food odors from lingering while you cook, and place odor eliminating agents around the kitchen (and in your fridge) to cancel out odors. A very effective natural deodorizer is SMELLEZE™ Reusable Cooking Odor Removal Pouches which can simply be placed in the kitchen and refrigerator to eliminate odor and will last for years and years without emitting any toxic chemicals. It’s a lot more effective than using baking soda or vinegar and safe to use around food. Baking a batch of cookies never hurts either! Ah, the bathroom. There are so many ways that small room can accumulate odors. From mildew to that “boy” smell, this is often the smelliest room in the house. So how do you get rid of it? Regular cleaning, of course, will help. But often these odors go deeper than a quick surface wipe down. The best tool to use is SMELLEZE™ Reusable Bathroom Smell Removing Pouches. These nifty odor zappers will definitely help your bathroom problem. If you have messy boys in your house, it is also advisable to use SANITRO™ Commode Urine Absorbing & Deodorizing Mats. Simply place the disposable urine mat around your toilet bowl and it will collect urine splashes, solidify and deodorize them. In about 6-8 weeks, simply discard and replace. Of course, it will also save you cleaning time. Sometimes, bad odors in the bathroom are related to a more serious issue—your sewer. Methane gas can be flammable in large quantities and dangerous to inhale, so it’s important that you pinpoint the source of a sewage smell in your house right away. While some problems can be fixed easily (e.g. clogged drain or empty P-trap), others are more complicated and will require the expertise of the professionals. If you have done everything you can and the smell still persists, call a plumber. Finding one in your area is as simple as searching “plumber Vancouver” (or wherever you live) on the internet. In the bedroom, the biggest causes of odor are your shoes, socks, bed sheets, and dirty clothes. Odors tend to cling to fabrics, so the best thing to do is to regularly launder your smelling clothing and add ODOREZE™ Natural Laundry Odor Cleaning Additive to your regular detergent to get that extra deodorizing effect. You can also store your dirty clothes in a laundry room or closed hamper away from your bedroom to prevent smells from accumulating. As an extra precaution, place a SMELLEZE™ Reusable Laundry & Hamper Deodorizing Pouch in your hamper to prevent the odors lingering and spreading especially if you don’t have time to wash your dirty clothing regularly. To clean out those smelly shoes, simply use SMELLEZE™ Reusable Shoe Smell Neutralizing Pouches. Just insert them your odorous shoes and leave them there overnight. The remarkable pouches will neutralize the odor and absorb lingering moisture in your shoes. (Moisture creates a breeding ground for bacteria, which give your shoes that bad smell). By taking care of these little things, you can drastically improve the smell and atmosphere of your bedroom and prevent it from reeking. Your living areas should be aired out and cleaned routinely in order to prevent odor build-up over time. Because odor clings to fibers, you should clean and vacuum carpeting regularly. Sprinkle SMELLEZE™ Natural Carpeting Smell Elimination Powder on carpets, rugs, and floor to pick up the odors (especially any smelly stains from kids or pets) and then vacuum it up when you’re done. You can even use this product on furniture upholstery, mattresses and any other stinky item. 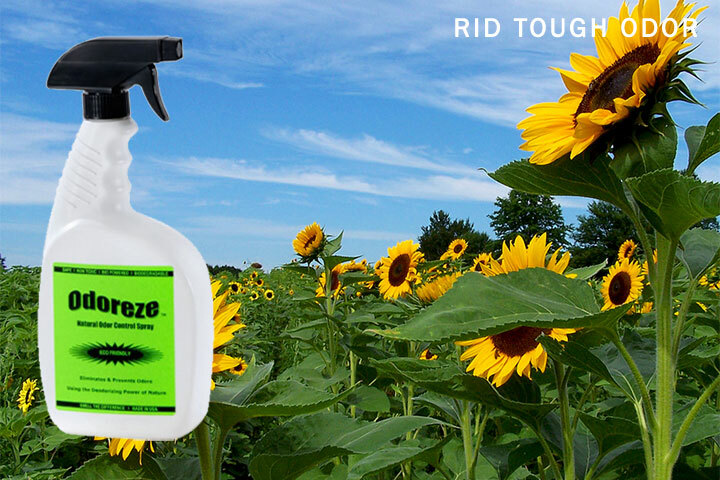 Additionally, wipe down wood and furniture with ODOREZE™ Plant Based All Purpose Cleaner & Deodorizer. This is a natural odor fighter —perfect for keeping your home both clean and smelling fresh. Fortunately, this product is available as a concentrate and just 16 ounces makes 64 gallons of working solution so a little goes a very long way and will save you tons of money. Finally, open the windows. Nothing clears out odor like good old-fashioned fresh air. This applies to any part of the house. Get your home feeling and smelling great with a healthy dose of fresh air. Nina Hiatt researches and writes articles to help people find balance and beauty in their personal space through landscape and interior design. In her free time, Nina blogs about many of her interests, which include gardening, home improvement, and baking. I would recommend using Smelleze® Reusable Home Smell Deodorizer Pouches to eliminate all nasty airborne odors. This is an excellent broad spectrum product to use if you are not sure of the source of your odor or just want to freshen up your home air. For a breath of fresh air, simply place Smelleze® pouches in all rooms or spaces with the bad odor. If you have a forced air HVAC system, you may also place the Smelleze® pouches on your return air vents to filter the odors out faster. Secondly, you can sprinkle Smelleze® Natural General Purpose Smell Deodorizer Powder on your carpet, mattress, sofa and other furniture to draw the odor out before it’s released into the air. Allow it to work for at least a few hours or overnight. The longer the better. Then simply vacuum and repeat the treatment, if necessary.